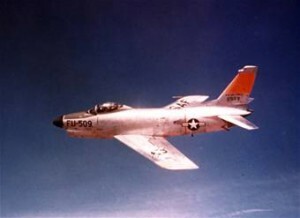 At 2:25 p.m. on the afternoon of January 23, 1956, an F-86D Sabre jet took off from Runway 05 at Westover Air Force Base for what was to be a routine training mission. However, just after take-off, the jet crashed in the neighboring town of Granby. It came down in an open pasture on the east side of Taylor Street not far from where it intersects with Brook and Carver Streets. The aircraft created a four-foot deep crater where it struck the ground and exploded. The pilot, 2nd Lt. John D. Ritchie, 20, of Lowell, Massachusetts, was killed instantly. He’d been assigned to the 337th Fighter Interceptor Squadron at Westover AFB.